Craigslist search: rear-wheel-drive, manual transmission, newer than 1980, less than $10,000. My quest for a new (used) car was set in motion. Such a search results in much nonsense, such as V6 Mustangs, 3-series BMWs that have been modified past the point of what a sane person would consider sane, Honda Accords (not rear-wheel-drive, people!) and all the Miatas one could ever hope to see. Why was I sorting through the craigslist muck when I had a brand new Ford F150 truck? I decided to approach my car-driving life as a coach would approach a pitching staff. The coach has one dependable ace (the F150), but doesn’t want to overuse the star pitcher. This coach needs to delegate innings carefully. Don’t fatigue the pitcher’s arm in the first half of the season. Spread those innings out amongst some other talented hurlers. I set out to find a vehicle that could endure the semi daily rigors of Seattle area traffic and give a bit of relief to the F150. Early on, I found a Lexus IS300. Its odometer read 60,000 miles and it sported a manual transmission. A phone call revealed the owner was out of town and wouldn’t be back for a couple of weeks. He never returned my call. I emailed about another IS300, this one red, also manual, but with more miles. Its owner responded that he will show the car in a three hour window and that multiple prospective buyers could then bid on the car. I took a hard pass on that one. I considered giving up on the pursuit. Perhaps this quest wasn’t meant to be. Driving a luxurious Ford F150 with a Coyote V8 wasn’t exactly a hardship. 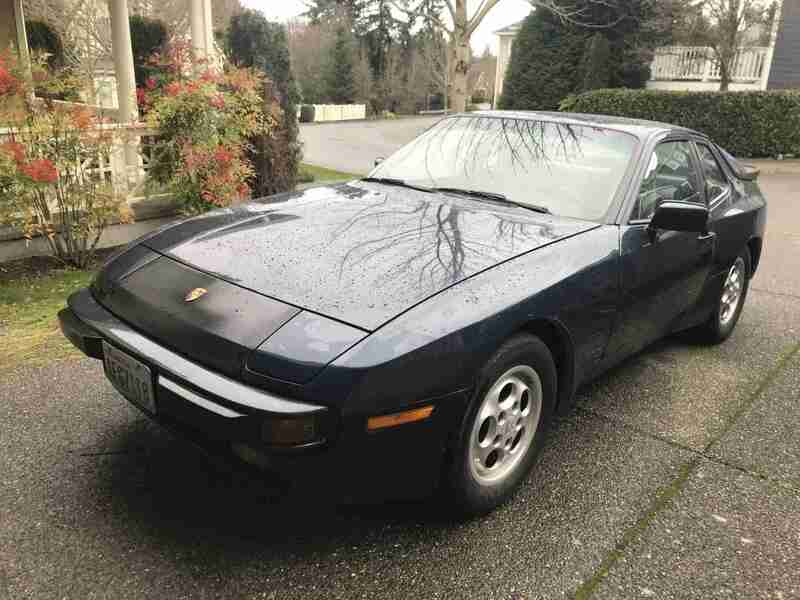 I stepped back and let the craigslist pages repopulate with fresh metal, when a 1988 Porsche 944 appeared on my iPad. It was blue with a light tan interior. It resided less than 15 minutes from me. “Interesting”, I thought. Then I emailed the owner. Several days later, he emailed me back. We set up a time to look at his car. Dan, the owner of the 944, and his wife had owned the car for twenty-five years, and it was her daily driver for a time. Dan had just retired and they wished to downsize a bit. Their garage included a Chevy adventure-van, 1980s Jaguar XJ6, Toyota Land Cruiser and a new Chevy truck. Dan and I went for a drive, agreed on a price, and I am now the owner of a 944. Included in the purchase price was the factory exhaust system, which had been replaced by healthy-sounding aftermarket exhaust. The Porsche’s odometer reads 143,000 miles and though it is in overall good condition, it is not completely without needs. The clutch occasionally does not return to its upright position, so I ordered a new clutch master and slave cylinder. The hood fell on my head, so hood struts are on their way. New wipers will replace the ones that are stuttering their way across the glass. Just to be safe, I ordered a tune up kit and will change the oil. The timing belt was changed at 122,000 miles, so that won’t need attention for a while. A bra adorned the front of the 944 when I bought it. I don’t like car bras. They trap dirt and moisture underneath them and then scratch the paint, causing more damage than they prevent. Removal of the bra revealed the paint to be in decent condition. It should look good with a clean and polish. It also revealed that the nose panel was black, instead of the azurite blue of the rest of the car. I will need to remedy this with a trip to a body shop. At least that panel is straight. I may be color blind, but I’m pretty sure that nose panel doesn’t match. 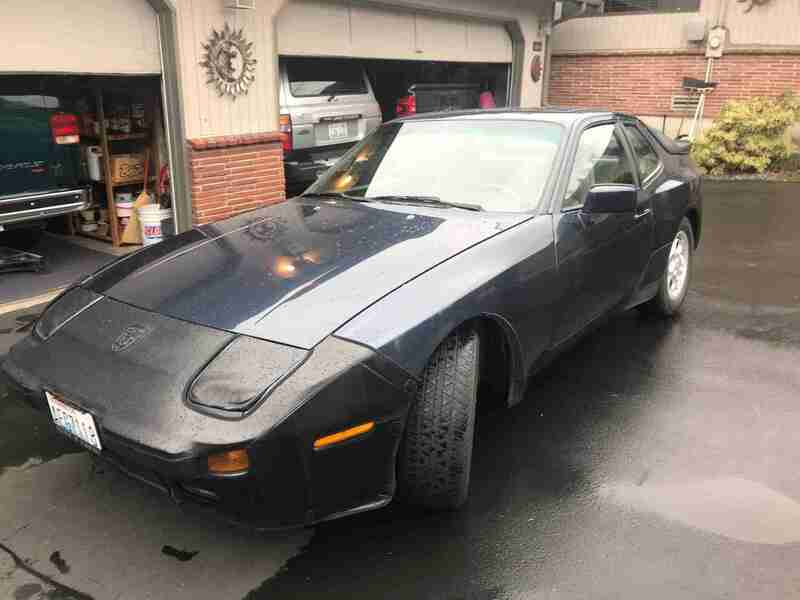 Updates for the 944 will be forthcoming. My goal is to have it in good enough condition to be a daily driver as soon as possible. Having said that, I admit that I’ve driven it to work (in the rain) on three of the four days I’ve had it. I believe the only thing that might leave me stranded is if the clutch hydraulics completely give out. I will keep a close eye on that until the replacement parts arrive. 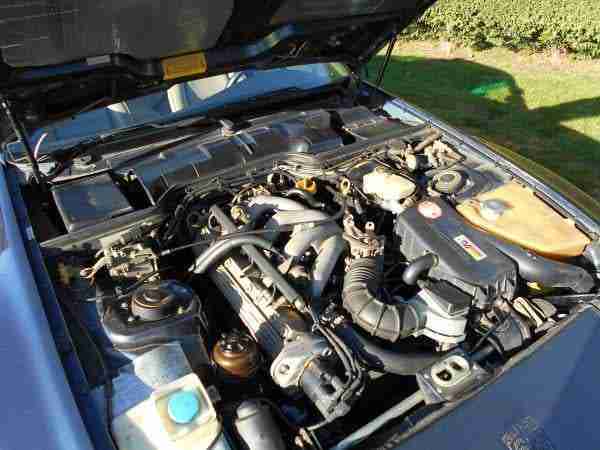 If I notice any degradation in that system, I will park the 944 until the fix can be made. In the meantime, I look forward to many miles of happy motoring. 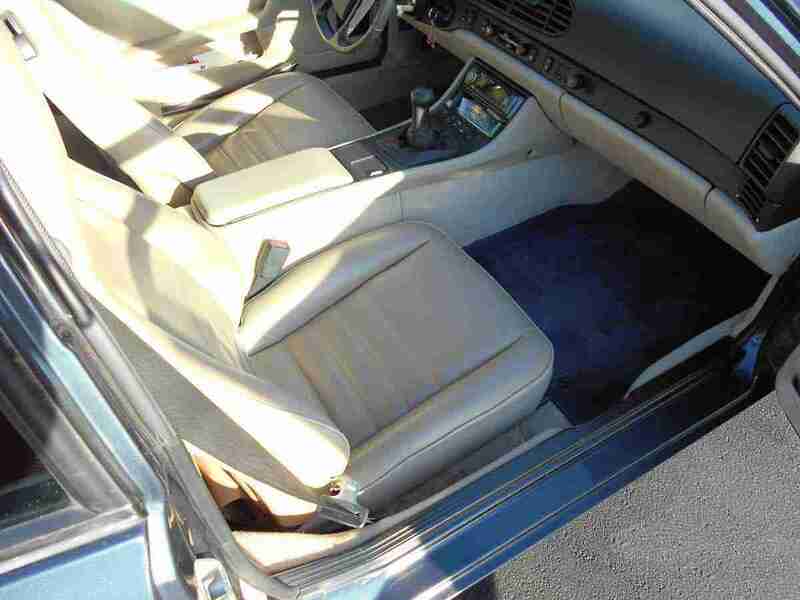 Interior is in great condition. The air conditioning even works. The 2.5 liter 4-cylinder 8-valve engine achieves 158 silky smooth horsepower thanks to its balance shaft.